Card numbers 35 and 36 are the sad bird sympathy card. Seriously….House Sparrows create sad times for our native cavity nesting birds in nesting boxes! PLEASE….DO NOT ALLOW THIS NON-NATIVE INVASIVE SPECIES TO NEST IN A MAN-MADE NESTBOX! Whatever you decide to do–passive or aggressive control, just do it! Do not let them reproduce using your nestbox. If you trap and dispatch, that’s the aggressive control–the best method of control. The English House Sparrow (HOSP) is one of two birds in North America that are non-native and not protected by Federal Law. The other bird is the European Starling (EUST). Both species of birds were introduced to our continent and remain today predators to our native birds and are territorial, aggressive, and take cavities away from our native nesters, including Bluebirds, Tree Swallows, Chickadees, and others. The House Sparrow attacks our native species, including incubating females and their eggs, nestlings, and will kill and build a nest over the corpses of our native species. 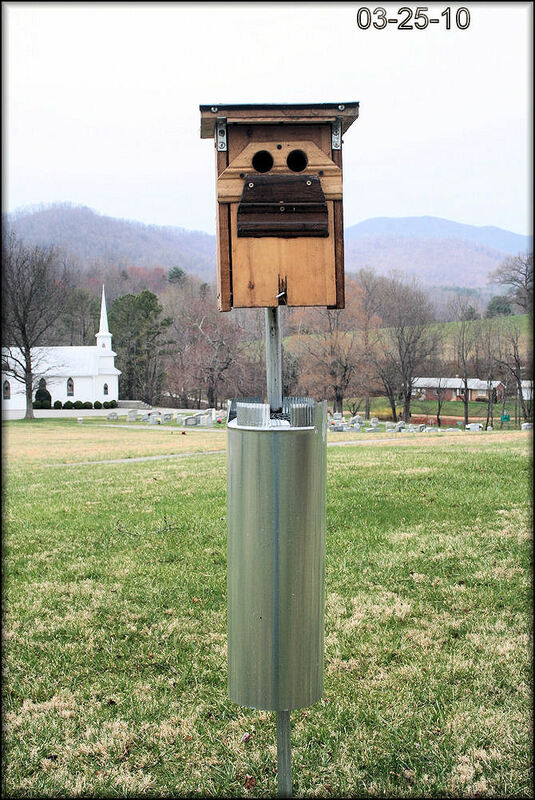 The 1.5″ entry hole on our man-made Eastern Bluebird nestboxes keeps the larger birds out, such as the European Starling, but the House Sparrow can access our nestboxes to cause havoc. 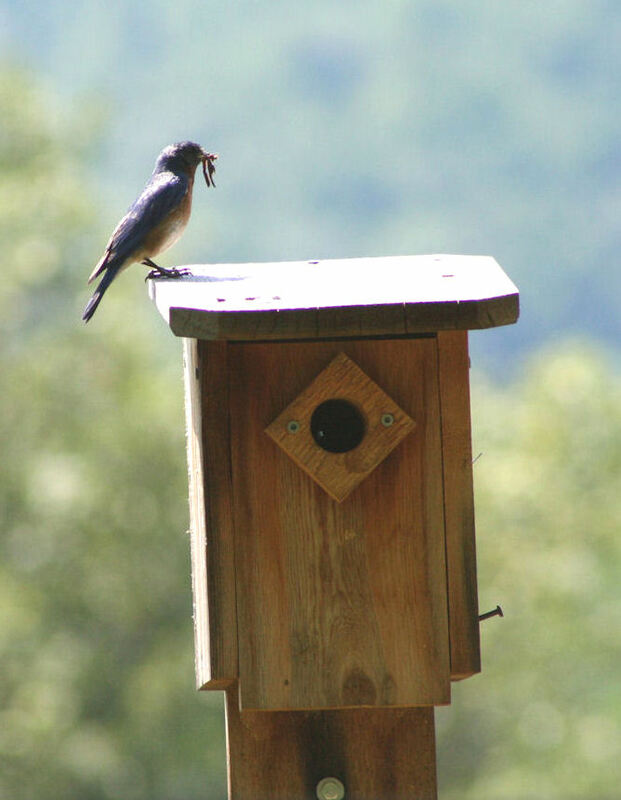 Given the widespread problems caused by House Sparrows, the North American Bluebird Society (NABS) advises that it is the responsibility of every nest box trail operator to ensure that no House Sparrows breed and fledge from their boxes. It is better to have no nest box than to have one which fledges sparrows. The non-native (English) House Sparrow is the biggest threat to the survival of our native bluebirds. LISTEN HERE TO THIS CLIP OF A GROUPING OF HOUSE SPARROWS. IF YOU HEAR THIS, YOU DO NOT WANT TO PUT UP A MANMADE NESTBOX. YOU ARE ASKING FOR TROUBLE FOR THE NATIVE BIRDS USING THOSE NESTING SITES. CITY LOCATIONS, PARKING LOTS–WHERE PEOPLE ARE AND THE TRASH HOUSE SPARROWS FIND LEFT BEHIND ATTRACTS THESE GROUPINGS. ALSO NEVER FEED HOUSE SPARROWS–NO MIXED SEED, PLEASE–THE KIND WITH CHEAP FILLERS, MILLET, CRACKED CORN, ETC. USE ONLY SUNFLOWER SEEDS, SAFFLOWER SEEDS, AND HULLED SUNFLOWER SEEDS. THISTLE SEEDS, THE BLACK NYJER, WILL BE LOVED BY THE AMERICAN GOLDFINCH, TOO. SPEND THE EXTRA FEW DOLLARS TO GET NUTRITIONAL FOOD FOR THE SONGBIRDS AND DO NOT FEED THIS INVASIVE SPECIES–MILLET IS THEIR FAVORITE FOOD AT SEED FEEDERS. Male House Sparrow–He bonds to the nestbox, not the female. Female House Sparrow. Not JUST another little brown bird! Original one-hole nestbox that HOSP tried to nest in. Thankfully, there were no nestling or adult bluebird deaths in this. Upon seeing HOSP trying to use this, I switched it out to the 2-Hole Mansion nestbox. … and then I switched out the one-holer to this, the two-holer mansion you see in this picture. Note the date: March 2010–the first year of the test. One predator guard. So! House Sparrows versus Bluebirds – always trouble for bluebirds! Read on below on how I controlled a House Sparrow situation in one location along my bluebird trail – an area where trapping and use of gadgets just was not possible or appropriate because of the location next to an elementary school and church and not being close to my home for me to manage trapping. A “defensible” nestbox for bluebirds in a House Sparrow location?! Really? How does it work? I removed HOSP nests and HOSP laid eggs first two years. THEN both same years, later after HOSP tried, the Eastern Bluebirds moved in after HOSP failed and had one brood both years. 3rd Season–Year 2012: no HOSP tried to build nests in this. THEN, THREE Eastern Bluebird broods too place successfully–no nestling or adult bluebird deaths from HOSP. This year, Year 4 2013: using this existing 2-hole mansion, nothing but bluebirds! At least thus far…. I agreed to do this test because the original one-hole nestbox I was using “in-town”…smack next to an elementary school and church and just behind someone’s else’s house and not near me. HOSP found it and tried to nest in it. Trapping was not convenient or appropriate in this particular location—therefore I welcomed trying this mansion two-holer out with agreement I follow the “keys to success” for this test site. I figured, “Hey, why not try this? I am always open to experiment, especially if it is to help bluebirds.” First egg clutch below for 2013 is in this 2-hole mansion. 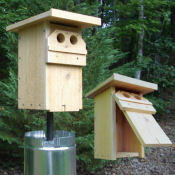 There is a stovepipe guard on this setup below the box, but no Noel guard is necessary because of the depth of this nestbox. Starlings, jays, etc., cannot enter or reach down that far. The two holes is the ventilation and provide an “escape” route in the event of a HOSP attack. The larger box gives the nestling more room to grow and stretch and exercise and julmp around inside the nestbox prior to fledging. The nestbox is air and water tight. Note: Even if HOSP broke bluebird eggs or attacked nestlings inside this nestbox, the adult bluebird survives by escaping through the extra hole. However, that did NOT happen on this test at all. That means if the adult bluebird can escape, they now have power OUTSIDE THE NESTBOX to defend and maintain their claim to the nestbox. When attacked inside a one-holer nestbox, they cannot survive a HOSP attack. Interesting 3-year test–very enjoyable for me. Hatching is expected on or around May 1 for this first clutch of bluebirds. This is a special treat for me to see this. 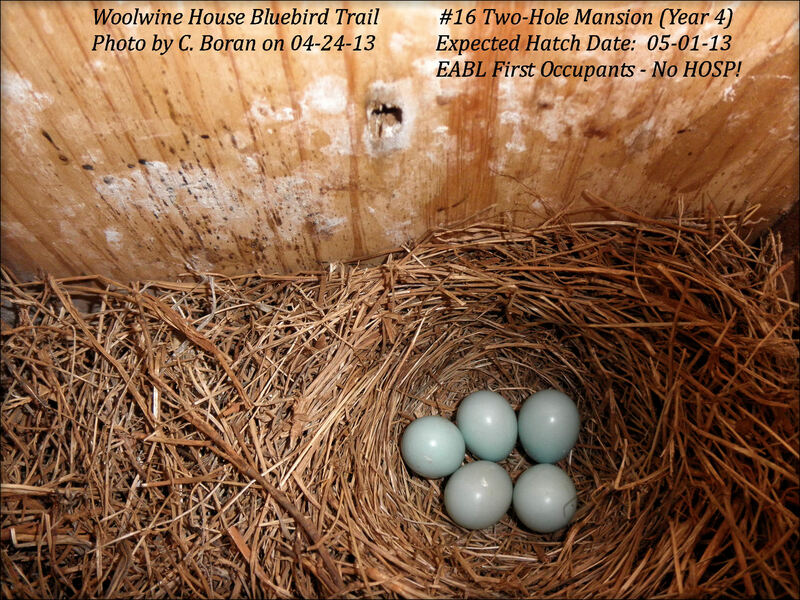 Though it was technically a 3-year test, the mansion remains and I’m continuing this year after year for more results to add to the records, a success story on my bluebird trail. Do I believe in trapping and dispatching HOSP? Yes. Did I need to in this particular location? No. Whether you agree with this or not, all I can tell you is Year 4 is starting and the HOSP have not returned or attempted to nest and there have been no tragedies. I’m just passing on the good news I’ve experienced in my efforts on this nestbox design—very appropriate for me to use in this particular location. Many thanks to Linda Violett for mentoring me on this for the past four years. I appreciate the patience you had with me on all my questions. Also a big thank you to the homeowner who allowed me to switch from the one-holer to the two-holer to conduct this test. “This Place Is For The Birds!”….. Bluebirds, that is, not House Sparrows! We have this up to welcome our visitors! DO NOT FEED AND THUS ATTRACT THE INVASIVE PEST SPECIES, HOUSE SPARROWS — MIXED SEED WARNING AND ADVICE–PASSIVE METHOD TO CONTROL HOUSE SPARROW POPULATION. If you have a birdhouse in your yard, your good intentions in attempting to provide birds with a place to nest should be applauded. However, many nature lovers don’t realize that by allowing a birdhouse to stand unmanaged, they are indirectly harming the very birds the house was meant to benefit, by providing a breeding ground for the worst enemy of bluebirds – the House Sparrow. House Sparrows are persistent, aggressive and destructive predators. They may destroy eggs and nestlings; and kill adult birds caught inside the box, sometimes building their own nest on top of the corpse. House Sparrows will not only prevent native birds from nesting in your birdhouse, but they will also breed there. One pair of House Sparrows could theoretically multiply into more than a thousand birds over a five year period. Soon House Sparrows take over all available boxes. It is better to have no box at all than to allow House Sparrows to reproduce in one. Bluebirds rely on pre-existing nest sites like nestboxes. Please help native bird populations rebound in our area by taking steps to keep House Sparrows and European Starlings (another aggressive bird that was introduced) from breeding in any birdhouses on your property. Because House Sparrows and starlings are not native, and are considered nuisance species, they are not protected by federal law. House Sparrow nests, eggs, young, and adults may be legally removed or destroyed. If you are not willing or are unable to do this, please consider taking the nestbox down altogether. If you want to leave the house up as a decoration, but don’t have the time or desire to control this predator, please either plug the entrance holes, use a “fake” painted hole on decorative boxes, or remove the birdhouse floor. One person indiscriminately putting out bird seed can also radically change neighborhood wildlife. Please do not feed birds bread, or seed that contains a lot of millet or cracked corn, as this attracts House Sparrows. Thistle, safflower, and black oil sunflower seeds are enjoyed by many native birds, but are not preferred by House Sparrows. Dumping food on the ground can attract rats. Rev.0.4, 06/09/07. Eastern Bluebird photo by Wendell Long. This page and photo taken from the www.Sialis.org site. Guess I hit send accidentally before I finished the comment! Sorry! I think you got the gist of the thing, though… Looks like I’ll have to use the pellet rifle on the house sparrow. Maybe I should shoot all the ones that are gathering at my box? I didn’t see any trap here (yet) for HOSP. I’ll keep looking to see how I can discourage / get rid of HOSP and encourage the bluebirds back. I’ll have to look for someone local who builds the 2-hole houses, I guess. Didn’t realize I had a HOSP infestation. Til I read your info. I put up a bluebird box, even though I have never seen a bluebird in my area. Two days after putting it up, a sparrow took claim to it. I hear what you are saying about the sparrow, but as an animal lover, could never destroy it. They are just doing what nature programmed them to do, as well. I live in a somewhat rural area, so I am not sure if that’s the reason bluebirds are scarce around her or not. There are also a lot of Starlings, here. I get a wide variety of birds from bluejays, cardinals, finches, woodpeckers, robins, etc. I only have the one box up in the front yard that I watch from my office window, and have not seen any fighting, although the sparrow does guard the box. A Red-headed woodpecker hopped up the tree toward the box and he chased him off, but no fight. For me, I like to attract all types of wildlife to my yard. I would never get a gun or harm a living things like you suggest. It doesn’t go with my nature. I’d have to be the one that just didn’t put up a box at all, instead. But, right now it’s not a problem. i had bluebirds year round. and now i can’t get them to come back. they come and check the house out but won’t stay. i raise mealworms for them. today they seem to be around more. i have other birdhouses but i plugged them all up and bought a new bluebird house.i can’t figure out what a bluebird and sparrow nest looks like. the one house has nesting all the way to the top. Sparrow????? I use my Red Rider from my youth to discourage the sparrow from hurting other birds. Well it may make some mad. Here in WV we get lots of Blue Jays and Cardinals I do like watching them. We have open hunting on House Sparrows. If I catch sparrows out and about trying to hurt cardinals my old school red rider comes out and I shoot like I’m back at Ft. Benning. You are doing everything right. Your bluebirds WILL be back once you eradicate the HOSP. Is anyone (or you) feeding cheap, mixed birdseed that attract HOSP? Do not feed millet, milo, or cracked corn at feeders. That’s a start. Second, are you near an “in-town” location where there are stores and parking lots and people trash? Sorry to ask this, but some people have that a block away and there are many HOSP located in large populations. Get rid of HOSP first, then the bluebirds will be back. Have you considered having a builder make you TO SPECK two-hole mansion? I have had great success (in its 6th year of successful bluebirding in a HOSP location) by using the two-holer. You can find the results on my website. Once the HOSP start using your nestboxes, then you can successful get and keep bluebirds. I am only feeding thistle and safflower seed because I only want songbirds in my yard. I know the HOSP doesn’t like this seed. I am in a nice neighborhood and don’t see any other feeders around and dumpsters are only about a quarter mile from my home due to the stores. I’ve seen the two hole mansion and have considered this so at least if my bluebirds get trapped they can escape. I’ve also been looking into the van ert traps as well and have no problem euthanizing these pests. This is great news about my bluebirds returning though! Thanks for your help! Much appreciated! Excellent, Karen. Do you know where to get the plans to build the two-holer? I suggest you find it on Nestboxbuilder.com. Do build it to spec — dimensions, etc, as listed on the plan. There are reasons it is designed as it is and with the size it is. Many try to re-think it and do particular modifications, and then don’t follow the KEYS TO SUCCESS, and then have failures in the two-hole mansion. If you want to insall a VanErt trap in the two-holer, you can do so but plug up the other other. I use 1-5/” size corks in mine. Also, this can be easily installed on a one-inch conduit and you can hang an 8″ wide wobbling stovepipe for predator control. Of course, a Noel Guard cannot be added to this design, but due to the depth of this box, the Noel guard is not needed on the two-hole mansion. Good luck, and thanks for checking in! we were so excited to see bluebirds nesting in our birdhouse only for them to disappear and leave us wondering where they might have gone. after inspecting the nest area we found four pecked eggs on the ground and no bluebirds. i guess the house sparrows ended our joy to have the natural bluebird inhabitants to leave and find a more hospital area to raise their own. we have no way to control the destructive invaders so later today the birdhouse is coming down. we will no longer buy bird food with millet or cracked corn in it. sadly, lesson learned. If you find you have House Sparrows doing that damage (as opposed to the House Wrens), ceasing feeding the House Sparrows their favorite food in mixed seed with millet, milo, and cracked corn was a super decision! I suggest using black oil sunflower seeds, safflower seeds, shelled sunflower hearts, and thistle seeds for your feeders. Most songbirds will enjoy those without attracting the HOSP’s favorite food to your feeders. Also make sure the feeder is not too close to your nestbox. I also make sure mine are separated by our house. The bird housing on one side and the feeders on the other side of our grounds. 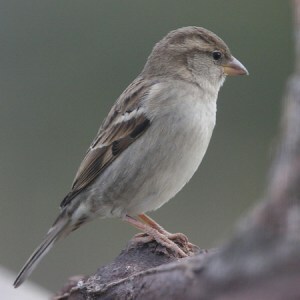 I am charmed by the female house sparrow. One of the most intelligent of birds as I am sure the blue birds are as well. Female house sparrows are exceptionally loving and intelligent. 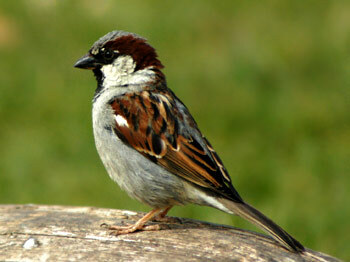 Its wonderful to hear house sparrows, wrens, blue birds and other birds on a sunny day. We have a feeder that attracts all these birds on to our property. The blue birds seem to get along fine with the sparrows. 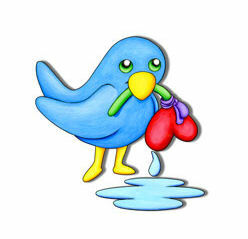 I haven’t ever witnessed any fights or nest take overs etc. I especially love to hear the chirps of the song and house sparrows and the cooing of the mourning dove. Its exhilarating to see the cardinals and the blue birds. I certainly agree that the blue birds and cardinals as well as the other yellow gray birds around our property should be protected, but since I love sparrows, I will protect them to my last breath. I’m glad you like the sad bird picture at the top of your post. My wife drew this for a friend. It is from her sympathy greeting card. If possible, please post a credit for her work, her name, Tessla Queen, or a link back to the website. Hi, Mr. Clinton. THANK YOU…..I always like to credit the artists. So many graphics publicly on the Internet with NO names on them. I will be happy to credit but need more info….Which website to the artist, please, so I can use the link to post? Are there other artwork of Tessla’s I can find? In other words, is there a copy of that sympathy greeting card that shows her name as the artist? That will help me very much. I just want to verify. Thanks so much. In the interim, I will add text on that particular page crediting her name now and can go back in to adjust. Card numbers 35 and 36 are the sad bird sympathy card. Her site has the copyright notice at the bottom with her name – copyright Tessla Queen. Yes, this helps. I’m happy to take the graphic down, if she prefers…or link to the sites. Which is preferred? I apologize for the delay on fixing the website. I have her name and link to the cards with her graphic on Bingtopia.com in the caption for the graphic. If you could look at it and let me know if this is OKand acceptable, I would appreciate it! Garages and farm buildings can effectively be blocked to sparrows by hanging plastic strips (10 – 15 cm wide) the full-length of open doorways. In livestock shelters, attach used net wraps with tacks or pieces of lath to the upper structures to prevent roosting. This is a great comment! Thank you so much for sharing this! Would love to see a photo of this somehow. We have just been invaded by the sparrows who are playing havoc with the swallows that we built houses for. Rats indeed. Thanks for the note here about your sparrow problem. If you positively ID’d them as the House Sparrow, the non-native, overpopulated sparrow species we bluebirds are constantly fighting against, it is my recommendation to not allow them to procreate in your nestboxes. Many bluebirds get sparrow traps and either destroy them or trap them in bulk in the larger traps made for this purpose and take them live to raptor rehabbers. You can use the passive method of making sure the nests are House Sparrow nests being built and remove those nests once the eggs are laid. Do not allow the House Sparrow to breed in your nestboxes. House Sparrows are nastier and will attempt to kill adult bluebirds, their babies, peck any eggs, or even kill an incubating bluebird or tree swallow female that is refusing to leave a nest of eggs due to her wanting to protect her nest of eggs or babies. Then the House Sparrow will build its own nest over the corpses of the killed birds. Not fun stuff to see. Do all you can to eliminate the House Sparrow. The male House Sparrow will bond to a box; not to a female. If you remove a nest of eggs, he might find another female to fertilize to use that box! Fight them, if you can, and keep them from bringing more House Sparrow babies in an already overpopulated non-native species that is taking natural and manmade cavities from our native birds. Good luck. Feel free to ask more questions here, if you wish. House Wrens, another “brown” bird that likes nestboxes, can also cause havoc for bluebirds, however, they are a protected species and should not be evicted from nestboxes. The only “nests” we are allowed to remove are dummy nests built by the wrens to keep other birds from using the boxes. They usually stuff these boxes with sticks (easy to ID) and to the ROOF of the box. If you see sticks that stop just below the entry hole, more than likely it’s a live House Wren nest, and they should not be evicted since it’s a native bird. Don’t remove the sticks if you think it’s a dummy nest until you can determine for sure it is truly a dummy nest (sometimes this is hard to determine). I use a telescoping mechanic’s mirror with a flashlight illuminating up towards the ceiling of the nest box to see if I see soft grasses or hairs on the bottom of the nest inside those sticks or any cottony material to hold the sticks together to determine a real nest to a dummy nest. House Wrens will peck bluebird eggs….or….they have been known to throw out bluebird babies on the ground so they can use the box. It certainly not the nicest thing to see. It’s their aggressive, territorial way of behavior, for a nesting location. House Wrens are prolific. House Sparrows are even more prolific…usually the first to claim a nestbox in the spring and have sometimes 5 broods per season! My sister in South Carolina gave me an authentic Bluebird nest fr my 70th birthday. Today I have visited my well sited house and and removed the start of a Sparrow nest four times. I have a rag stuffed in the hole now. Maybe that will encourage the Sparrow to build elsewhere. When I was age 15 and my father wanted to keep a Martin house free of sparrows he gave me a Red Rider B-B gun. We lived in the country then. Wow, I’ll never look at sparrows the same way again! Can’t wait to see more of the beautiful photographs you provide. You are doing an excellent job! This form has been customized to educate the wonderful folks who have given me permission to install my boxes on their properties and other people I know who may be interested in helping our protected cavity nesters from the House Sparrow and Starling invaders who are overpopulated and kill our cherished birds.